In real network, when operations master server fails due to hardware issues or some other problems, we need to move the operation master role to another domain controller as soon as possible. This move process is called seizing. Therefore, Seizing an operations master role means forcing an operations master role onto another domain controller. Before we seize operations master roles, we must permanently disconnect the domain controller that holds the operations master roles from the network. 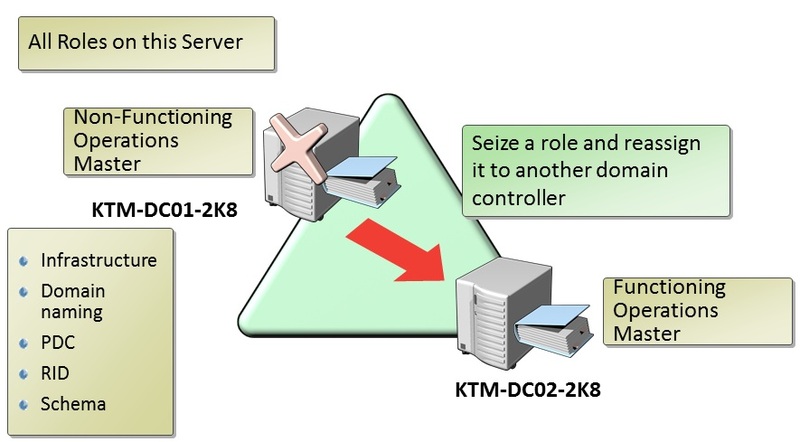 Here, all Operation Master Roles are on KTM-DC01-2K8 domain controller. In this scenario, currently this server is Offline due to hardware problems. 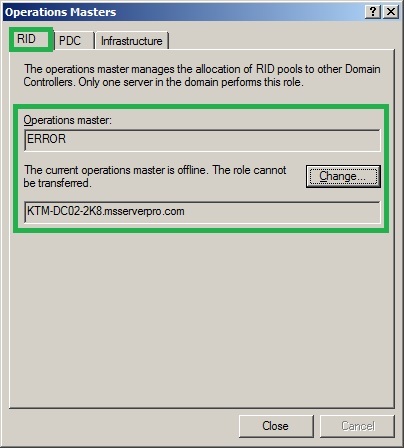 So we get an error when we open Operations Masters roles on other domain controller KTM-DC02-2K8. To solve this problem, we have to seize Operations Masters roles and reassign it to KTM-DC02-2K8 domain controller as soon as possible. Before KTM-DC01-2K8 become Offline, all Operations Masters Roles are in the KTM-DC01-2K8. 1. Log on to KTM-DC02-2K8, working DC. 2. Open Command prompt, in the Run box, type cmd and then Click OK.
3. At the Command Prompt, type ntdsutil and press Enter. 4. At the ntdsutil prompt, type activate instance NTDS and press Enter. 5. At the ntdsutil prompt type roles and then press Enter. 6. At the fsmo maintenance prompt, type? and press Enter to see a list of available commands. 7. At the fsmo maintenance prompt, type connections and press Enter. 8. At the server connections prompt, type? and press Enter for the help Information. 9. 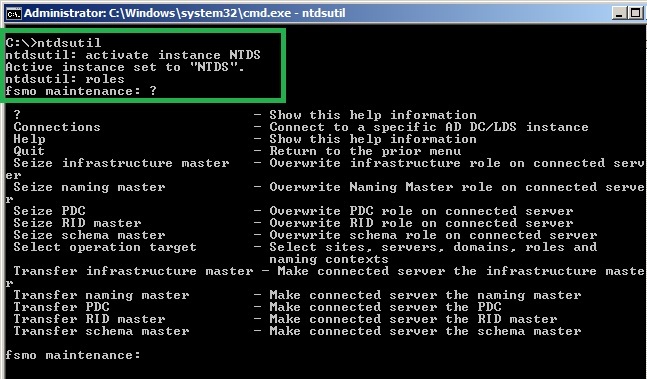 At the server connections prompt, type connect to server followed by the fully qualified domain name (FQDN) of the domain controller that will be the new role holder, and then press Enter. Here FQDN will be KTM-DC02-2K8.msserverpro.com. 10. At the server connections prompt, type quit and press Enter. 11. At the fsmo maintenance prompt, type one of the following commands to seize the appropriate operations master and press Enter. 12. At the fsmo maintenance prompt, type quit and then press Enter to gain access to the ntdsutil prompt. 13. At the ntdsutil prompt, type quit and then press Enter to quit the ntdsutil utility. 14. At the Command prompt, type netdom query fsmo to verify all the Operation Masters Roles in KTM-DC02-2K8.msserverpro.com. Seizing an Operations Master role is critical whenever the Primary Domain Controller is non-functional for business continuity. The above article outlines how to carry out the role seizing operations. I hope this helps. Thanks for providing this great info.